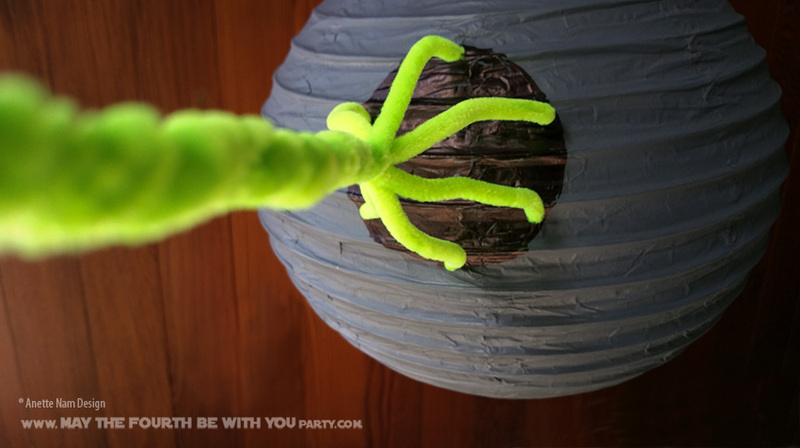 There are 4 things you have to have when throwing a Star Wars party: Grey spray paint, black sharpie, blue painter’s (or electrical) tape, and duct tape. Armed with those in your tool belt, you can improvise and take care of most Star Wars party related “emergencies”. Not that this was an emergency. But it was a last minute idea. We wanted something new to hang up… So a Death Star seemed appropriate. I found a paper lantern in my closet, spray painted it grey….. and voila… instant death star. In hindsight, the 10″ lantern I used looked a little small, so I might go for a bigger one next time. Looks like they have up to 24″ lanterns in grey paper on Amazon. YEAY! I’ll have to try that. Hang the lantern up outside and spray paint. Let dry for an hour or more. Draw a black circle, and any other markings you want on the death star. Make a laser beam out of pipe cleaners. Carefully poke holes and insert the laser. Attach the string or wire. Hang it higher than eye-height – you want to make sure the laser does not take anyone’s eye out. If you paint it, a light inside would not be very useful. But if you find one made of grey paper – you can light it with a LED candle.